The Clone Recon Trooper is a minifigure based on a Clone Trooper from the 91st Reconnaissance Corps in the Star Wars universe. The Clone Recon Trooper, like all Clone Troopers not from The Clone Wars subtheme has a plain black head piece. The minifigure also has a leg piece made up of white legs with a black leg joint, with torso and helmet pieces with standard Phase II Clone Trooper printing on them. However, in addition to this standard printing is the red logo of the 91st Reconnaissance Corps, printed in the centre of the torso and on the top right-hand side of the helmet. A two red, horizontal stripes are also printed above the visor, with a gap between them in the middle. The trooper's back printing is different in design. While some aspects along with the general outline of the armor remain the same, the standard backplate is replaced with a rectangle that is primarily white on the left and red on the right. White rectangles with grey outlining are printed towards the top left and bottom right of this large rectangle, along with a black horizontal line on the white side, and a small black rectangle and grey circle on the red. Underneath this main rectangle is a smaller rectangle, which is primarily red, with some white lines inside, and grey shapes around the edges. This trooper is armed with what was used as a gun before pieces specifically moulded to look like guns were released in 2007. This consisted of a black Part:4349, which is also commonly used as a megaphone, with a transparent light blue round stud on the end. 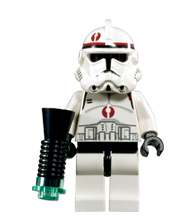 In LEGO Star Wars: The Video Game, this minifigure appeared under the name "Clone Trooper (Episode III, Walker)". This character was armed with the same gun piece as its physical counterpart, and could also use its gun to grapple in certain areas. It appeared again in LEGO Star Wars: The Complete Saga under the name "Clone (Episode III, Walker)" with the same abilities, along with being able to build objects like most non-droid characters could. The 91st Reconnaissance Corps was a corps of Clone Troopers during the Clone Wars, led by Commander Neyo. This group participated in the Siege of Saleucami, one of the major conflicts in the Outer Rim Sieges. After the battle was won by the Republic, Order 66 was issued, where Commander Neyo and his wingman eliminated Jedi General Stass Allie on their BARC speeders. In LEGO Star Wars: The Visual Dictionary, this minifigure is referred as both a "Clone Recon Trooper" and a "Captain-rank clone trooper". The ARF Trooper that appeared in the 7913 Clone Trooper Battle Pack has markings that indicate it is a member of Lightning Squadron, a group which is a part of the 91st Reconnaissance Corps. Facts about "Clone Recon Trooper"
This page was last edited on 12 March 2016, at 00:59.